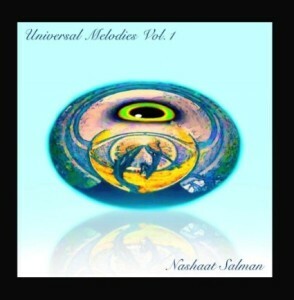 On his new album, Universal Melodies, Switzerland’s Nashaat Salman presents a tight bunch of layered key-moving ditties. “Summer Night Joy” begins, a Latin-influenced mélange featuring Salman’s expert piano playing, the strong main melody, a light percussion bed and Spanish guitar-sounding lead. This opening track is light and infectious with lots of intersecting lead lines and a great groove — a great way to kick off this EP. “Chasing” presents sweeping keys, then into trilling arpeggios, a lilting main melody with key swipes rising and dying all over a shunking back beat. There are two “Dancing Star” tunes here. One is a regular track, a swirling Middle Eastern-flavored tune, with snapping percussion and all light tickling leads with descending high-tuned, wood-sounding lead lines and the radio edit of the same tune. Again Salman employs lots of different keyboard sounds here, creating quite the tapestry, so his leading isn’t just an excuse to show off his dexterity. It’s no real stretch to opine that instrumental music can get really boring really quickly if not handled by a master. Producer/composer/orchestrator/keyboardist/arranger Salman manages a quick and easy control early on in these compositions, keeping the music moving over whatever flavor he is cooking with and offers enough diversity in his arsenal of keys that each tune stands on its own and is unique.